Back in January, I did some fibre preparation. This beautifully deep grey alpaca was part of Joyce’s stash. My goodness, the vegetable matter and the filth! In the end, I decided I needed to flick card every handful. That improved it a good deal and made me feel that it was unquestionably worth the effort. And then I washed it, because it was still very dusty–otherwise I have one long “hayfever” attack for the duration I am spinning. And no wonder–look at the drift of soil and seeds left behind! Here is the washed fibre, and some of the carded batts I made. Friends, I have not been keeping up with my blogging. I apologise. Life in my day job has been challenging this last year, but change is coming and perhaps we will see more of each other in the not-too-distant. This not keeping up means I have crafting projects that happened some time ago that you have never seen. Here is one of those projects. This post is part of the Tuff Socks Naturally project, an open, collaborative project exploring more sustainable alternatives to superwash and nylon in sock yarn. You can join in on the discussion on this blog or on the blog of the fabulous Rebecca at Needle and Spindle or on instagram using the hashtag #tuffsocksnaturally. I am still working with Suffolk fleece, and I have been really keen to dye some with indigo. I finally gathered up my nerve and tried refreshing my indigo vat over a long weekend. And, success!!! In order to conserve dye and because the Suffolk is robust, full of vegetable matter, dirty even after washing, and hard to felt, I decided to flick card the locks prior to dyeing. That is what you can see in the top image. When I was able to achieve that deep blue in the picture above (the photo colour is not perfect–but this is NOT pastel blue), I felt no regrets. Then, to the drum carder. No felting at all despite the challenging-to-wool alkaline environment of the vat followed by a lot of rinsing. Now the image below shows the colour most accurately. Colour me extremely happy about this yarn. My previous sock spinning efforts had persuaded me that I was not getting enough ply twist to create a robust sock yarn. When I bought my spinning wheel, I decided to invest in a high speed head as well as two interchangeable whorls. I was experiencing confidence that I would be spinning well into my future and want to use the wheel to its maximum capacity. Since then, the place I bought that wheel, then the only spinning wheel seller in the city outside my Guild (which sells second hand) has closed. I’ve used everything that came with the wheel with only one exception, so that was a good call. Now to use the last accessory: the high speed head that would make it easier to get serious amounts of twist into my yarn even on evenings of weary spinning and distracted plying. Well, here is that yarn all wound up and ready to knit, waiting its turn in the knitting queue! Just between me and you… as I write it has made it onto the needles and I’ve had the all-important conversation with a recipient who feels no reservation about this not-Merino-soft, local, plant dyed, single breed yarn. Over a hot chocolate and chat tonight she took one look, squeezed the sock-in-progress and said YES! I loved running workshops over summer, but it has also been a treat to return to my spinning wheel. This skein began as grey corriedale fleece. I dyed it in the grease with Earth Palette dyes, carded, and pulled a roving directly from the drum carder through a diz. I have seen this technique demonstrated on YouTube, but I was only prepared to try it after someone from my Guild (who is a fabulous spinner) showed a group of us how she does it. 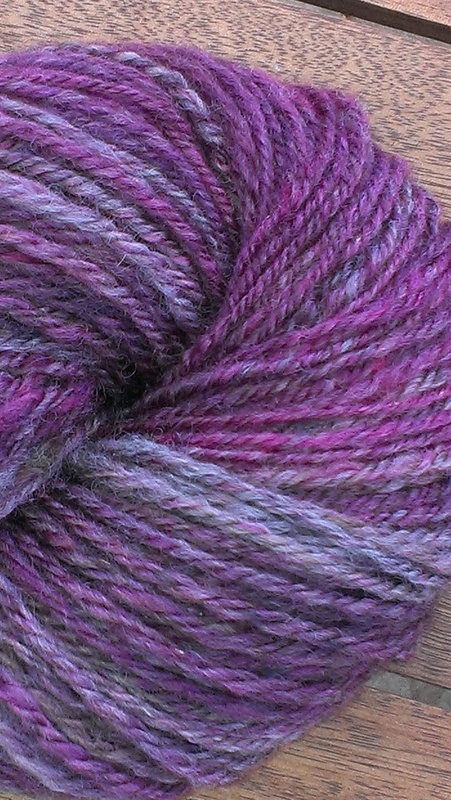 I like the colour, and enjoyed the process of producing roving. Being able to dye in the grease is one of the things that has me returning to Earth Palette dyes. It improves my pleasure in scouring, and makes me content with scouring small quantities. Does my impatience show? One of the workshops I ran over summer was on ‘fancy yarns’–artyarns to the inhabitants of the internet–and it has been good to come back to spinning the kind of yarns I prefer to knit. I love the challenge of artyarn spinning, and the results, but I am a plain spinner in my heart, apparently. This is relaxing spinning for me and I’m enjoying relaxing a little. The yellow/green/blue corriedale that I dyed at the same time has already become a beanie for a dear friend’s birthday, even though there will be no call for him to wear it for some months yet!